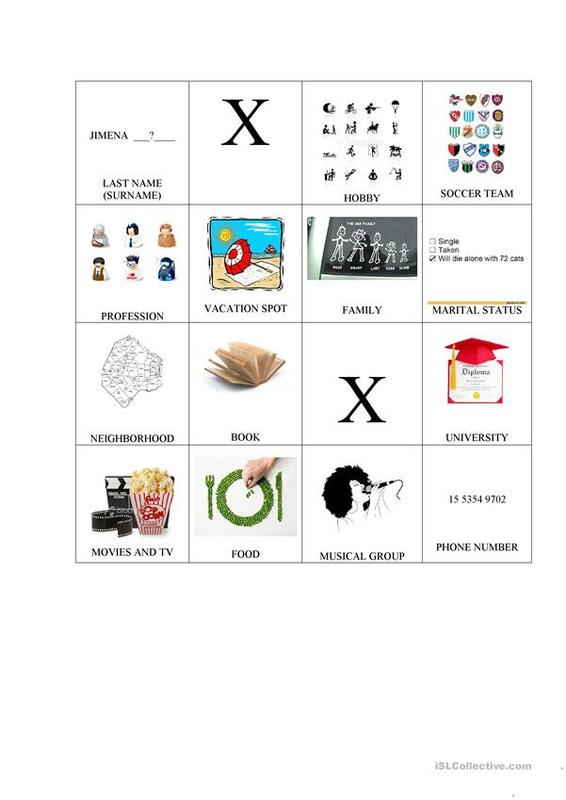 I used this chart with beginner-intermediate students. When I called out a topic, we went around the room and whoever had that topic on their bingo board told us something about themselves related to that topic. It was a great first-day-of-class warm up/discussion starter. The present downloadable handout is recommended for adults at Beginner (pre-A1), Elementary (A1), Pre-intermediate (A2) and Intermediate (B1) level. It is a useful material for practising Present simple tense in English, and can be used for enhancing your pupils' Speaking skills. alclaire is from/lives in Argentina and has been a member of iSLCollective since 2013-03-17 18:19:48. alclaire last logged in on 2013-04-09 20:56:53, and has shared 1 resources on iSLCollective so far.